That was the theme of a side event organized by Harvard Medical School’s Program in Global NCDs and Social Change, the NCD Synergies project at Partners In Health, and the Helmsley Charitable Trust on the eve of the UN General Assembly and the third UN High-Level Meeting on NCDs. The standing-room only event was held on Sept. 25 in New York and was attended by more than 130 people, including high-level participation from the Ministries of Health of Rwanda and Malawi, the World Health Organization, the World Bank, and a wide array of global health policymakers, funding agencies, stakeholders, and academic and implementing organizations. dr. joseph kibachio (right) speaks on a panel of national ncdi poverty commissioners alongside (from left to right) dr. wubaye walelgne, dr. baghawan koirala, and dr mary mayige. Lancet NCDI Poverty Commission member Dr. Julie Makani (Professor of Health and Allied Sciences at Muhimbili University in Tanzania) served as Master of Ceremonies for the event, and Commission Co-Chair Dr. Gene Bukhman presented an overview of the work of the Lancet Commission, the national NCDI Poverty Commissions, and the Voices of NCDI Poverty initiative. 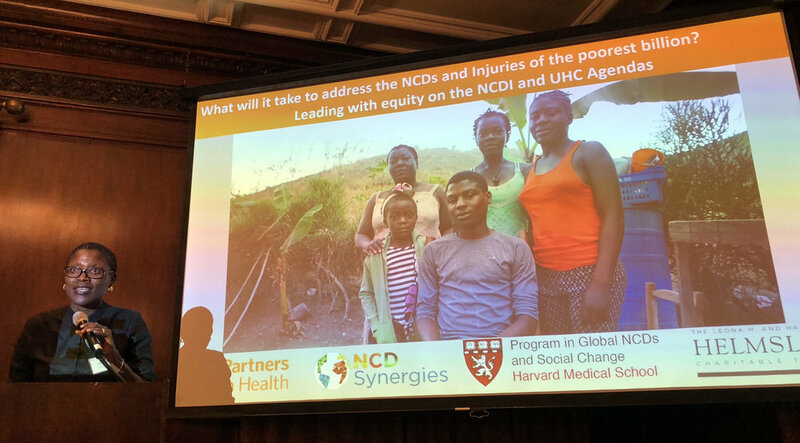 In his presentation, Dr. Bukhman highlighted the importance of reframing NCDs and injuries for the poorest billion and the need to pursue a nationally-led process to prioritize interventions for severe NCDIs that disproportionately impact the poor. Examples and lessons from that process were provided by a panel that included representatives from four of the national NCDI Poverty Commissions — Dr. Wubaye Walelgne (Ethiopia); Dr. Bhagawan Koirala (Nepal); Dr. Mary Maybe (Tanzania); and Dr. Joseph Kibachio (Kenya). Dr. Gary Gottlieb, CEO of Partners In Health.